Dr. Tsuneko Tsukitani, professor at Osaka University of the Arts, succumbed to a long battle with cancer on the evening of September 23rd, 2010. She was Japan's leading expert on the shakuhachi, its history and music, and a beloved colleague who wholeheartedly supported the efforts of her peers, students and friends. Many non-Japanese shakuhachi enthusiasts will remember her for her energetic participation in the 1998 Boulder Shakuhachi Festival, where she gave academic lectures on the shakuhachi along with her colleague, Zenpo Shimura. Although she was not able to attend the Sydney Festival in 2008 because of her illness, she worked behind the scenes to insure that the festival received necessary funding from the Japanese government. We will all miss this vivacious woman and her warmth, wisdom and friendship. Indeed this is very sad news and the shakuhachi world has lost a person with an incredible knowledge of the shakuhachi, its history and music. She was my supervisor during my fieldtrip in Japan doing research on instruments. Her enthusiasm and support to her students and anyone doing research on shakuhachi and music in general took me by surprise. She was so involved in people's research and came with so much support and suggestions and encouraged people to work hard... which she waas such a good source of inspiration of. The funeral ceremony (告別の式) is scheduled to take place in the afternoon Monday 27th. More details on exact time and place will come. Simura Zenpo wrote that he would like to make a special ceremony for shakuhachi people to say goodbye to this incredible woman who has elucidated so much of shakuhachi history to the world. He asked if anyone had suggestions on how to do this, please do let us know. Kiku it is unusual for a Japanese woman of her generation to pursue the shakuhachi path. Do you know how this occurred? Was she also a player, if so, what ryu? The story she told me was that she was a student in the musicology department at Tokyo Geidai (Tokyo University of Fine Arts) when she told her supervisor Moroi Makoto (the composer of Chikurai Gosho) she wanted to do research into something unusual. He told her then, if you want to do research into something unusual, then do research in shakuhachi. She began and she told me she was not prepared for the way the fascination of this music, the instrument and its history would take her. She got taken by it and the research of shakuhachi became her lifetime passion and work. Stories such as she sat throughout the long fukiai sessions at Myoanji recording without having time to even go to the loo floats around... she was a fascinating woman! Tsukitani did not play herself - not more than basics and what she might have done in her private life. She was a full blown researcher. She told me that since she was the first professional researcher working on shakuhachi, it very often helped her she did not play because people would not be afraid of her "stealing their techniques". And yes, Tsukitani was an unusual wman... my aunt's best friend studied with her and told me that she has never known anybody with so much energy like Tsukitani... something we - in the shakuhachi world - have benefitted from with the results of her amazing research. And what a year 2010 has been to the shakuhachi community! They will live on in our memories and hearts! I'm sorry to hear the news about Tsukitani sensei. I enjoyed listening to her lectures on the history of shakuhachi on several occasions, most recently at Bisei back in 2007. Yes, this year has been a big loss for the shakuhachi community with Yokoyama Katsuya, Tsuneko Tsukitani and also Tom Deaver's passing away. Thanks for the reminder, Daniel. I shouldn't have done that mistake. We would like to plan a date and time when people all over the world can play a piece at the same time as a tribute to and a goodbye to this amazing woman and researcher of shakuhachi. If anybody would like to participate could you please let me know either here or send me an email. Shimura Zenpo would like to write the countries (and perhaps cities) where we will be playing in an information sheet for people at the funeral. Shimura also requests those of us who will be able to record and upload our selves onto YouTube to do so under the title "月溪恒子先生に捧げる尺八音楽" (Tsukitani sensei ni sasagu shakuhachi ongaku = the shakuhachi music dedicated to Tsukitani Tsuneko sensei). Perhaps if we can gather in small groups - it would be nice. But even our selves would be great too. Yes, she definitely will be missed. She has been fighting it for awhile but apparently it came as a fairly big shock. She was in the hospital for awhile and got released and even expressed that she was going back to school soon. I guess there is just no telling what the future has in store for us. This year the shakuhachi community has been pretty hard hit with the losses of a few great ones. I have a concert in Gifu tomorrow but will probably perform Tamuke on Sunday for her with a few other shakuhachi players. There will be a gathering and as Kiku noted Shimura sensei is hoping some people dedicate a song to her via youtube. I always found it interesting that such a dedicated shakuhachi enthusiast and researcher was not a shakuhachi player! I think most players, like myself, want to delve into what they are studying and search for how this all came about. But she just had a pure passion of searching for the truth and enjoying the music. I hope more people like her emerge, we need them to keep the balance. As Dr. Lee mentioned in his research, a lot of the shakuhachi information we have is ryu-ha (school) biased. She definitely enjoyed and focused on honkyoku, but the non-player view is always interesting to read...She will be missed. On Monday 27 September at 12:30 local time in Japan people will be playing synchronised Choshi/honchoshi/honshirabe/honte no shirabe around the world. This will happen when Tsukitani sensei's body is to be cremated. After Choshi, we will play Kyorei and Tamuke, but as not all ryu-ha have these pieces in their repertoire we have decided on Choshi as the synchronised piece with the other two afterwards if you want to. If you want please let me know the location you will be playing this. Also as mentioned before, Shimura also requests those of us who will be able to record and upload our selves playing onto YouTube to do so under the title "月溪恒子先生に捧げる尺八音楽" (Tsukitani sensei ni sasagu shakuhachi ongaku = the shakuhachi music dedicated to Tsukitani Tsuneko sensei). I hope many of you will join us. Will be playing from NYC. I believe that would be on Sunday 11:30pm to correspond. OK so 1:30 on East Coast Australia, I will do it. Do you want me to use jinashi? If I want you to use jinashi??? I don't care and I am sure Tsukitani sensei wouldn't care either... so play which ever you want. Anything is good! It felt really good to do even though 4:30 am was early! Thank you to all you who emailed to me telling you will join. That's SO cool you did it, Perry! It was my absolute pleasure. Those who have devoted their lives to the shakuhachi with positive affect has my deepest respect. Shimura's request seemed quite befitting. People need to be acknowledge for their altruism. As for the recording, the kids were asleep in the next room so I had to play softly, which falls into playing Meri, which makes getting the Dai Meri notes properly in tune quite difficult. This photo will also be used in the European Shakuhachi Society's next Newsletter. 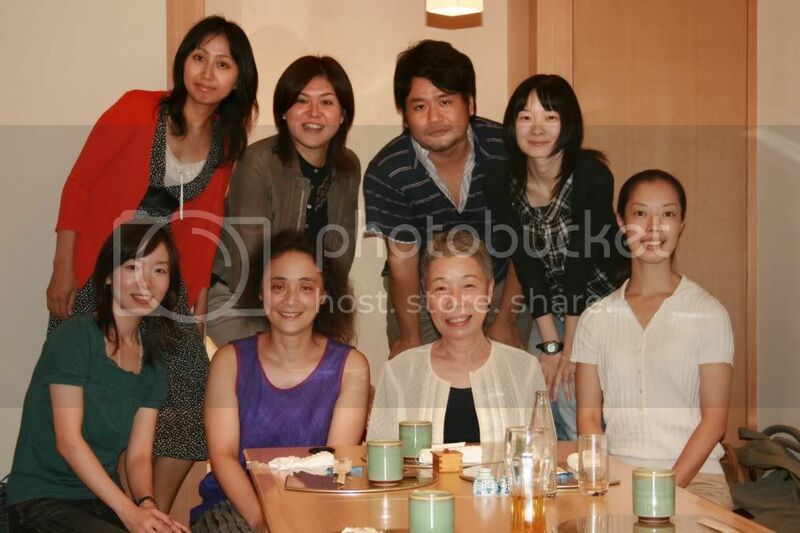 But I thought since we have lately talked so much about Tsukitani Tsuneko sensei, I'd post this photo here. This is at my leaving do with her and all her PhD students. They were all great people. Well, she is obviously the woman second from right in the first row.